While Piano Concerto No 3 was dedicated to Bartók’s second wife, Bartók’s opera Duke Bluebeard’s Castle was dedicated to his first wife, Márta Ziegler. The tale of Bluebeard and Judith has roots that date back to biblical times. The story took Bartók’s fancy when the Hungarian poet Béla Balázs read his version of it to Bartók in mid-1910. Perhaps he saw its eternal message already being revealed in his domestic circumstance, for its autobiographical relevance is striking: a young wife wanting to know and love her mysterious, considerably older husband; an older husband, a loner, fearing that her youthful desire to know him and all his secrets would be their relationship’s undoing. Bartók’s setting of Balázs’s dramatic scene is an immensely powerful musical construction that spans the best part of an hour. The work is one large sound arc, in which time and structure are measured by the successive openings of seven doors. Even in a fully staged version, there is virtually no stage action. This is a psychological drama, which is equally effective in concert or semi-staged performance. The opera is prefaced with a short enigmatic Prologue, which begins: ‘Once upon a time … Where did this happen? Outside, or within? Ancient fable, what does it mean, Ladies and gentlemen? The song goes on, You look at me, my eyes are on you. The curtain of our eyelids is raised: Where is the stage: outside or within, Ladies and gentlemen?’ Bluebeard and Judith then appear in his gloomy castle—‘empty, dark and forbidding like a cave hewn in the heart of solid rock’. Little by little, through her relentless coaxing, some of the secrets of his past are revealed. The first two doors open onto Bluebeard’s torture chamber and armoury, which on closer inspection turn out to be stained with blood. But Judith wants to believe something different of her husband and overlooks these obvious signs of cruelty. Bartók’s music parallels the developing plot, beginning in a gloomy F sharp key and, as Judith comes to see the blood that covers his unsavoury possessions, introducing a shrill, dissonant motive (often associated on stage with a lighting change to a deep red). This motif will return time and again throughout the opera as each door reveals something more about Bluebeard’s bloody past. The next three, central doors—opening onto Bluebeard’s treasury, garden and kingdom—make Judith more hopeful of his love. Here are the riches of his spirit, the evidence of his love and pride, and the wonders of his creation and power. But each turns out to be specked with blood—the jewels, the flowers, even the clouds. As Bartók’s music grows more and more passionate and grand, culminating in a gloriously open C major passage involving the organ at the fifth door, the shrill motif, with its blood-red associations, is still preset to return. Behind the sixth door is a lake of tears, ‘the water of buried grief’. The brilliant lights start to dim. The openness of the music starts to turn. Judith’s jealousy takes on a form derived from Bartók’s shrill ‘blood’ motive. She must now go on to the final door, behind which are Bluebeard’s three former loves, held in a timeless and idealised state. And she must now join them. All chance of fulfilment in love is lost. The woman’s insistence on knowing what should not be known has been her undoing. For the man, the tragedy is the realisation yet again that he can never experience true love. He is doomed to an eternal misery. Bluebeard is back to square one, as is Bartók in the music. In parallel with the lighting, it winds back down to the gloomy F sharp—the opposite of the gloriously radiant C of the fifth door. The dramatic circle is completed as Bartók draws in to the mournful pentatonics of the opening. Both Bluebeard and Judith are entombed in his castle. Judith was his fourth, and last, chance. After the Ladies of the Dawn, of Noon and of Evening, she is the Lady of the Night. Bluebeard has the last word: ‘Henceforth all will be darkness, darkness, darkness’. 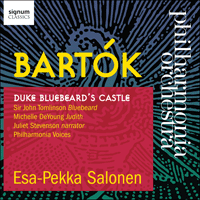 Musically, Duke Bluebeard’s Castle is wonderfully crafted, with a simple, firm symmetry in its structure that Bartók would imitate in several later works. In style it is not yet fully mature Bartók (many a conservative listener has been pleasantly surprised at that! ), but stands as a summary of all the influence upon Bartók up to his 30th year—a Bartók still on the verge of modernism. It is the spiritual heir of Wagner’s Lohengrin, yet has more than a little of the dramatic intensity and hysteria of Tristan und Isolde. The opera’s clear, speech-like representation of the Hungarian text owes much to Debussy’s recent experiments with settings of the French language in Pelléas et Mélisande but also to his own studies of Hungarian folk music and folk poetry over the previous half decade. The representation of Judith and some of the more dissonant passages of writing for orchestra betray Bartók’s keen interest in Richard Strauss, in particular Salome, which he thought a brilliant work, but also Elektra, which he had just seen in 1910 and found to be not as effective as Salome. If you were an innocent Hungarian girl, 17 going on 18, would you not be a little worried when your 30-year-old husband dedicated such a work to you? The plot, with its message of the irreconcilability of the sexes, did not bode well. In 1910, just months after their marriage, Bartók had written to Frederick Delius: ‘I am very much alone here, apart from my one friend, Kodály’. But Márta stood loyally by her man through grim years of war, epidemic and revolution, bringing up their son, running the household, even copying out her husband’s music and writing out his letters. We have to wonder, however: did she actually find their sudden divorce in 1923 a blessed release from Bartók’s ‘castle’?